With the lead up to Easter…this year’s celebrations for me are a little different. The highs and lows, sadness and happiness all combining to signify how more important it is to live life and to it’s fullest each day. Cherish and take joy in life’s simple little treasures. 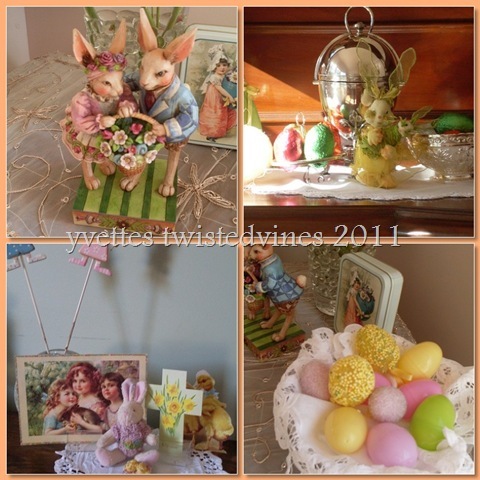 My sister decorated her home over the weekend for the celebration of Easter. 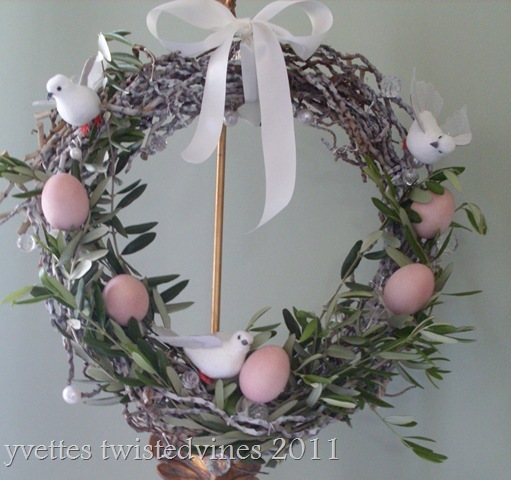 Eggs, bunnies, olive vines and doves of peace. This wooden wreath holder, was on sale last week, I couldn’t resist it, and fell in love with it straight away…I’m not sure how I’ll get this in my suitcase…if not I’ll have to leave it behind. Fresh olive branches were used as a symbol of peace. Palm Sunday is being celebrated soon, and often, in Italy we’re given an olive branch. This Easter Bunny figurine is “Happy Together” designed by Jim Shore – Heartwood Creek, you can see more of his beautiful Easter figurines here. I love the intricate details and beautiful colour palette of his artistic works. The top right photo is of an antique silver egg warmer, and displays chocolate coloured foiled eggs. Thinking about home I also looked back on posts that I had done early in two thousand and ten. And as today is Tuesday I usually share the more dainty things around my home. 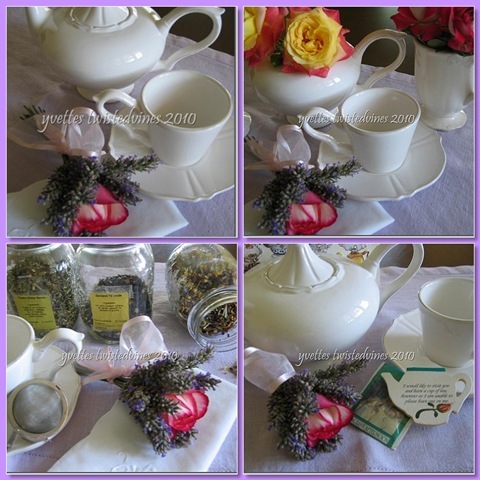 I love the shape of the teacup saucer and lid of the teapot. All white with a pale grey pink trim. Unknown to me is the make of this tea set, but I love it’s Simplicity. I do love your white china. The tea pot is such a fab shape and the cups too have a gorgeous shape. Very dainty and graceful. How long are you still with your sister before you return to Italy? I hope you are able to fit your wreath holder into your luggage. As always a beautiful post an I love your antique egg warmer. sometimes, suitcases are not designed the way we need them to be! Thank you for sharing, Yvette. Your posts have been the very essence of Spring and the upcoming Easter Joy. So many lovelies. I didn’t know about the olive branch. The perfect touch to your wreath. Why don’t you come join Seasonal Sundays this Sunday? Up and down..yep, that is life around here for sure! But you have such pretty things, sitting among them must be a high! I love whites so esp. enjoyed your pot and cups. And an egg warmer? I never knew there was such a thing!! Thanks for showing me…have a good day. 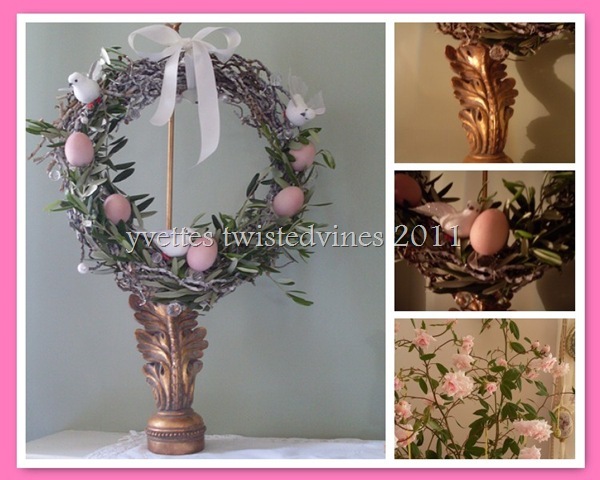 i love this Easter wreath, it looks amazing the way you decorated it. And I love the colorful eggs, makes me know Spring is coming. What a wonderful tea post! I love your wreath; very sweet! I enjoy making wreaths myself! I hope you can fit it into your suitcase to take it home with you. I always enjoy seeing a white teapot and china. I love the simplicity of it. Thanks for sharing yours and thank you for stopping by to have tea with me.